I wanted to make a video about this product so I could SCREAM at you for 45 seconds and BEG you to try out these candles, but I’m rushing to get to a birthday party and just don’t have the time today. I COULD USE CAPS FOR THE ENTIRE POST – BUT YOU WOULD HATE ME IF I DID. How about you just believe me when I say these are the best smelling candles on the market PERIOD. Back story – my son ruined two of my Yankee Candles but adding toys and paper into the hot wax. ON THE SAME DAY, a rep from Febreze emailed me and asked me if I wanted to try out a candle from their new Home Collection. I had just lost two huge candles and said I would be interested. The timing was perfect. I emailed her my address and went along with my day. By the end of the week, the package came. I ripped it open, lit the Febreze Home Collection candle and started to tidy up the house. In MINUTES the room I was standing in was filled with an amazing aroma. I was SO HAPPY and SOOOOOO SHOCKED. Normally, candles smell good when they aren’t lit. They never give off a scent to fill a room. Then, I went to my bedroom to put away some laundry and I swear to you the freaking smell eventually made it’s way into my bedroom. By the end of the hour, my entire house was smelling like vanilla frost. I mean – WHAT IS THIS ABOUT??? The next day – you aren’t going to believe me – but I was laying in bed and lit the candle in my room. After a while, I actually had to move the candle to the hallway because the smell was almost TOO STRONG for my tiny room. So, I put it in the hallway – and once again – my entire house got a smell makeover. I am not getting paid for this. I DID get a free sample, but I am telling you – this is a candle to own. Forget about the $20 competition. 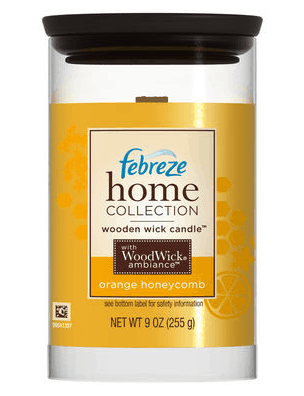 Head over to your local Target, CVS, or wherever Febreze candles are sold and pick out a few!!! You can also or check out the collection on Amazon . I believe you! I have the same candles in other scents and it’s the best candle I have ever used! I also received it for review and LOVE them!